At LI Script our pharmacy is fully automated. We utilize state of the art technology and keep ourselves informed about the latest innovations in the industry as well as changing regulations. We know that technology is a powerful tool that can help save your facility money, improve efficiency and lower your rate of error. Our hands-on staff will ensure you have the right technology and work with you to get everything set up properly. Ordering: Computerized physician order entry (CPOE) allows physicians to directly send new medication and prescription refill orders electronically thereby ensuring standardized, legible, and complete orders. Physicians have the ability to log onto the system from any computer via the internet to review and approve orders. Electronic entry allows orders to be transmitted to the pharmacy faster. Transcribing: Entering medication orders electronically eliminates errors caused by poor handwriting or the use of abbreviations. The system will alert physicians and clinicians to a particular patient’s drug allergies and current medications. Orders go directly to LI Script pharmacists for review. Dispensing: LI Script checks orders for drug–drug interactions and allergies before dispensing. 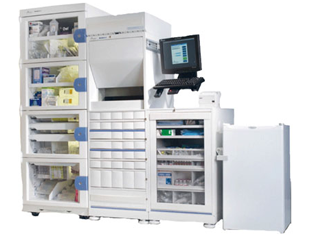 LI Script can provide your facility with MedSelect Flex Automated Medication Dispensing Cabinets (ADC). An ADC helps reduce medication errors, control costs, comply with regulatory agencies and increase staff productivity. This is accomplished through multiple levels of security, best-in-class data storage, robust reporting capabilities, true unit dose dispensing and single item access capabilities. Administration: With bar code E-MAR we ensure you are in compliance with the “Five Rights” of medication administration: right patient, right dose, right route, right time, and right medication. With the proper systems in place, you can easily check delivery status in real-time and monitor drug use. Additionally, our systems ensure you order only medications included within your facility’s formulary. Technology to help you improve resident care…and save money too! Medication Administration Systems – LI Script’s E-MAR is compatible with all popular systems and is HL-7 and NCPDP 10.6 E-Rx compatible. Our programmers will integrate systems as needed. Most EHR and EMR systems are compatible with LI Script. Controlled Substance Electronic Transmission – LI Script has been approved by the Bureau of Narcotic Enforcement and can accept electronic controlled substance prescriptions by prescribers. This will eliminate the need for Official New York State Prescriptions that typically accompany controlled substance prescriptions. LI Script will assist the facilities in getting approval to transmit electronic controlled substances from the Bureau of Narcotic Enforcement.